The annual KVSC 50-hour marathon trivia contest is finally done, I can rest now. We took 5th, which was a bit of a disappointment, but we played the game the best we could with the resources we had. Since Christmas, most of my free time has been devoted to getting ready for the contest for various reasons. This year saw a large jump in the IT needs of The Learned Pigs and Fireproof Women, but I managed to rise to the challenge and delivered a solid performance as the IT department for our team. I can’t really elaborate here for strategic reasons as to what all the preparations involved, but the end result was, in the words of one of my team members, the lowest level of stress she’s ever encountered during the 50-hour contest. Everything performed reliably, and other than we could have used even more bandwidth than we already had provisioned, everyone local and remote was happy and had a great contest. It feels weird sitting at home after my normal workday with little, if anything, pressing to do. ‘course, there is only 250 or so days until we start the preparations all over again. I can’t wait. All that, and our first “real” snowfall happened about a week ago, so everything is all nice and white. Otherwise, I’ve been working too much, projects are piling up, what’s new there, eh? Soon Christmas will be here, then New Year, then the KVSC 50-Hour Trivia Contest. Maybe I’ll take the time to drop an update here about those? We can all wish, can’t we? I escaped work around 1:30, and off to the fair I went. Sure, I knew it was raining, but it was the first day of the fair! Not to mention, Ryan Shupe and the Rubberband was performing at the Leinie Lodge, the free stage across from the Food Building. And the Pronto Pups were calling my name. And the Bull Bites. I’ve been to the Minnesota State Fair every year of my adult life, most of the time more than once in a single year. This year is no different - I’ve already planned 6 days of visits…starting on opening day, today. Sure, there are the days when I’ll be playing the dual role of tour guide/navigator, or Monday night when I’ll be heading down to attend the Weird Al concert, but then again there’s also my visit today, which will be completely unattached and unencumbered by schedules. Just time for me to do all the people-watchin, pronto-pup-eatin, commercial exhibit display-viewin that I cherish so much. If you’re gonna be down there, drop me a line, maybe we can meet up and compare notes on the new foods…I sure hope the Sloppy Joe-on-a-stick is better than that gross Spaghetti-on-a-stick I was so unfortunate to have tasted a few years back. And if you’re not planning to go…well, you’re missin’ out. Don’t take it from me, take it from Bonny Wolf, commentator for NPR, who flies in from Washington state every year to partake in the Minnesota State Fair. I’m a digital (as well as physical) packrat. I have all my emails going back to 1994, most of the documents I’ve created in that time (as many as allowed by my previous employers) and a whole collection of IMs. The text messaging on my phone has always been a missing bit of data - until now there’s been no good way to get it off of my phone. To anybody wondering, looks like everyone in the immediate circle of friends and family were safe from the bridge collapse. I almost said unaffected just now, only to realize there’s no one in the twin cities tonight that is unaffected by tonight tragedy. We’ve all driven over that bridge plenty of times, walked and biked under it many times, too. It could have been any of us. To those that lost someone they care about tonight, my thoughts go out to you and your loved ones. All I can say is, it really does work. The virtual keyboard. The full-page rich web browser. The pinching UI fingertip motion. The double-tapping to zoom in/out. The new iPod interface. (With built-in speakers…finally I don’t need to share my earbuds!) Mail viewing. Everything the hype said it would do, it does flawlessly. Two let-downs so far? For some reason, if you overzoom the Google Maps application in satellite view, it responds by filling your screen with “No Images” messages. Second? Lack of mail rules, but I should have been doing those server-side this whole time anyway, so I setup procmail this morning and I’m good to go. So, in replacment of mail rules, I’d nominate the lack of wide-screen mail viewing. For fixed-width 80-column mail messages, such as system reports, the portrait mode just doesn’t cut it. I finally got out of work today around 3:45. The past two weeks have been 12-18 hour days, it was good to escape…especially because I had succumbed to the hype and decided to treat myself to the a new geek toy. The iPhone was to be mine. The long story is included below. The short story is I got one, activation went flawlessly, my existing number has been ported and I love it! Indeed, I’m writing this post from my iPhone while sitting on the couch. 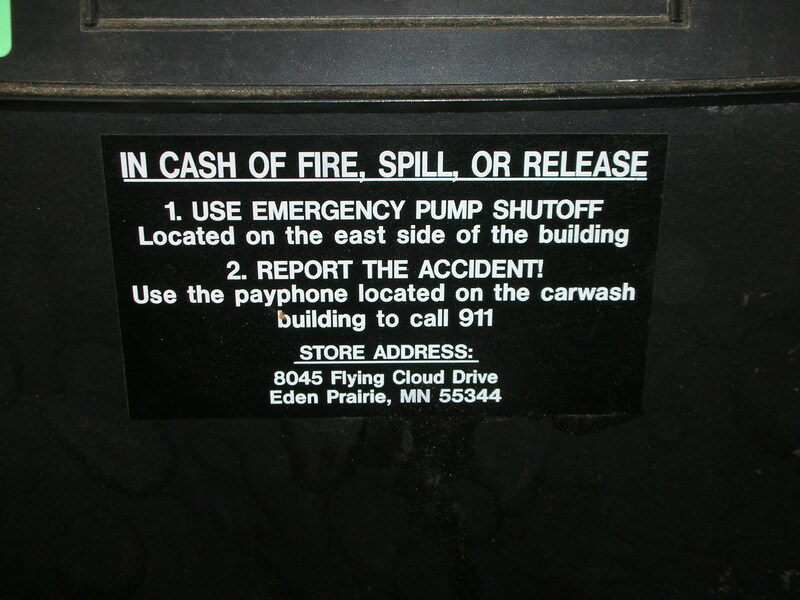 Gas Stations Need Proofreaders, Too! On the way back from lunch on Tuesday, I forced my coworkers to sit in the car while I filled up with gas, so I didn’t have to do it after work. What did I find on the pump? 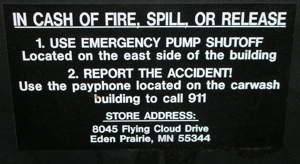 So, do they need proofreaders, or do they just need someone with half a brain who cares enough to check the stickers before they are placed upon every single pump? You’d think with today’s gas prices, they’d have enough profit margin to double-check these things before putting them up for everyone to see. What happened to me today? My coworkers and I went to Joe Senser’s for lunch today. I hadn’t been there for years…the inside looks completely different than it did the last time I visited. They also seemed to have added NTN since the last time I was there. Rock on, just what I wanted over lunch, a trivia quickie! I asked for a Playmaker, thinking I’d just play a little in the background while chitchatting with coworkers over our meal. Low and behold, the first full game I played, I ranked 21st in the entire network. Sadly, they only show the top 20 on the big screen, but I took first at our location. I was still pleased…I’ve never placed so high in the network standings before. What happened on the next full round? I ranked 5th in the entire network. I only missed 544 points the entire round. My name (SRLOIN) was up on the big screen. I expected balloons to fall down from the rafters, noisemakers rattling, bells sounding, but all I got was the congrats from my coworkers. Truth be told, the sunburn on my legs was quite impressive. The horizontal position really gave them quite a bit more sun than the upright bicycle’s vertical position (who would have guessed?) and I’m paying the result even today. Liberal applications of aloe gel didn’t help, neither did the milk treatment. Other than draping cold packs over my thighs and knees, the only real relief has been a good thick spray of Solarcaine every few hours. I try and time it when I know my shorts will be rubbing against the top of the sunburn, as the exposed section on the top of my knee on my lower thigh seems to have gotten hit the worst. I got a bit of sun on my face as well (I sweat too much for anything to be really effective there) but the pain there has been manageable, and it seems that it is already starting to peel. Sleepless nights, waking up every time I roll over onto a sunburned side-of-leg, and painful days, cringing every time I stand up from my desk and feel my shorts scrap the sunburn, are nothing compared with the success I feel from finishing the 62-mile Ironman Bike Ride again. It is all worthwhile. The weather forecast was promising. Sunny, high around 80. Compared to the last two years (2005, 2006) of the Ironman Bike Ride this year was going to be a piece of cake. I had spent many weeks preparing my new trike for the ride, sometimes to the detriment of my own training, but I felt comfortable that if I just took it easy, I could overcome the metric century (~62-mile course). Life has been good since I got my Sun EZ Tadpole. ‘course, most nights have been spent working on said bike, but I have to admit I’ve been learning a lot. Spent so much time staring at the bike I had to give it a name…Pollywog would be her official name, but everyone know she’s Polly for short. Fitting for a tadpole bike, dontcha think? A week with the new trike. I have to say, it has been a blast. Almost like learning to ride again. Different muscles, different techniques, different habits. 17 miles doesn’t seem like a lot (my total according to MotionBased), but I’ve spent more time working on the trike than riding it in this first week. Shannan (Bump) Fairfield on This thing still on? gunnhildur on Nike's "Real Women"